Today I’m going to ask you to take a challenge. This year we’re embarking on a huge adventure as a community with The 777 Project. If you don’t know what I’m talking about, The 777 Project is an adventure and philanthropic initiative to run seven ultra marathons on seven continents in order to raise funds and awareness to build seven schools with Pencils of Promise to make the impossible possible for thousands of students around the world who don’t currently have adequate access to education. We’re fundraising in a few different ways but one of the core ways that we’re going to raise this money is with the help of a small army of supporters. The small army concept is that a small group of people taking consistent action over time leads to massive results. We’re looking for 250 people to step up to the plate. I sat down to do some math the other day and spotted something interesting. 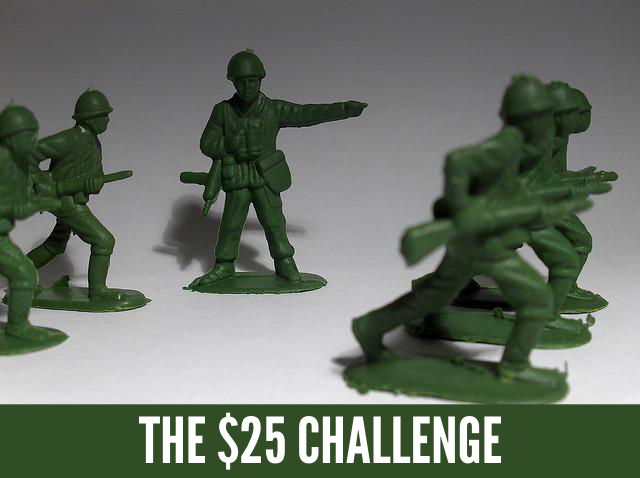 A small army of 250 people donating $25 per month would raise $75,000 by the end of the challenge. That’s half of the total money we need to raise. The first time I ran those numbers, I thought I’d counted wrong. That can’t be right, can it? But it can be right. It is right. That’s the power of the small army. That’s the power of compound action. As with anything I encourage other people to do, I’m out in front. I’m putting my money where my mouth is. I believe in PoP, I believe in the students we’re helping, and I believe in you. I believe that you can help us do something that most people would think is impossible. I’m stepping out first and I’m looking for 249 other crazy people who think that something like this actually might be possible. I need 250 people to join me. Dozens of people have already signed up but we need more. Our impossible goal: 249 other impossibles. If you’re not sure what to do, watch the video below and follow the steps to donate today. This is awesome. When we get together, there’s so much that we can achieve. Kudos for going so big on this.